You are here: FAQ / Can I have my artwork delivered? Can I have my artwork delivered? YES! We have a large van which can take a 300 cm x 200 cm painting. 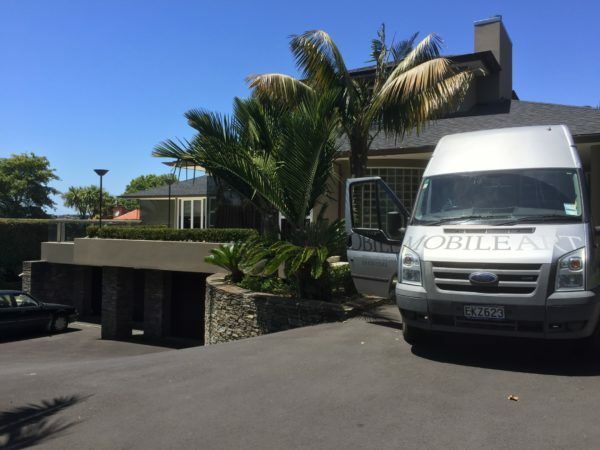 We deliver artwork within the greater Auckland area, as far south as Hamilton and Tauranga and north to Whangarei. If you are outside these areas, we can arrange delivery of your artwork to you. We package the artwork carefully and send it by a courier firm that we have worked with for many years. We have arranged delivery of artwork to major cities around the world including London and Los Angeles. If you are an artist and you need artwork collected and delivered on your behalf, please get in touch and we are happy to quote you for this service. Our van is specially equipped for transporting and delivering delicate artwork – carpeted flooring, duvets to wrap art, padded support beams so that artwork is not rubbing on hard surfaces.